This expressive piece emanates both style and sustainability. Tulianna and Alejandra Garces believe in "green chemistry." Lucky for us, they also believe in high style. An evocative, expressive piece full of natural charm, this necklace emanates style and sustainability: they use toxin-free, bio-based resins and a process aimed at reducing carbon footprints. 18" L 24-karat gold plated chain. Handmade in Colombia. Make it a set! Click here to see the matching Full Moon Earrings. As any fine handmade product, please handle with kind care. Please don't expose to water or extreme temperatures. If it gets wet, please wipe dry with a towel. I got this for my son's girlfriend who just graduated from college. When I called he said she was wearing it that day. I thought she'd like it because it is unique, simple and very pretty. I think I scored good with it! I purchased three of these necklaces - one for myself and one for each of my nieces. When my mother was dying, she was blessed by a Native American Chief and given the name Princess Harvest Moon. I wanted us to have these by this year's Harvest Moon to honor my mom. I'm most disappointed that the necklace in person looks nothing like the necklace in the photo. I thought it was going to be a flat gold, sort of fragile necklace. But it's gold flecks suspended in a thick resin (and the flecks in my moon are far fewer than what are shown in the picture). There is an opaque sort of line within the resin that the chain feeds through. It disrupts the beauty of the necklace and certainly isn't visible in the picture. I'm still going to wear it. I just wish it looked more like what was purchased. Especially since I had purchased three. 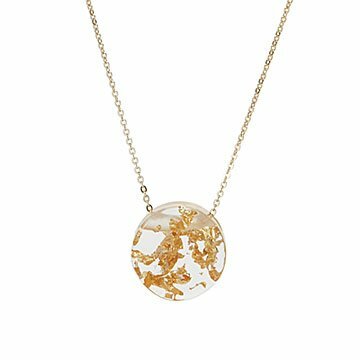 (And for the record, this is a review for the gold leaf Full Moon necklace, not the necklace that's shown in the picture as I'm writing this review - a necklace with multi-colored stone moons). I received this full moon necklace the night before my college graduation. It proved to be the perfect gift, given at the perfect moment. Not only did it add the perfect amount of flare to my graduation gown (which was much needed) but it went with every outfit I wore throughout the day and evening; its lightweight and low maintenance but unique design lends itself to any type of outfit and occasion. The thing I love most about the piece however is the story behind it. Knowing that I was wearing something with such an important message of social responsibility at its core definitely makes it all the more lovely to wear. Looks nothing like the picture - threw away. I bought this for a friend and she loved it. It's the perfect size and the color was even more striking in person.